Until 2002, the genus Leiurus Ehrenberg, 1828 (Buthidae) was monotypic with Leiurus quinquestriatus (Ehrenberg, 1828) as the only species. In a recent article, Lourenco and co-workers describe the twelfth species in the genus, this time from Algeria. 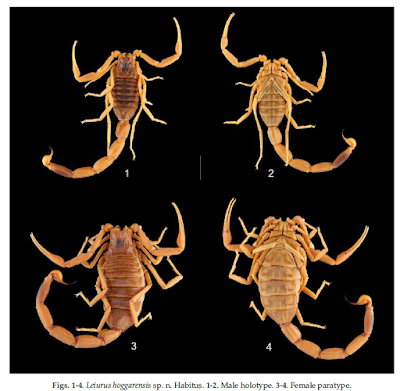 A new species of buthid scorpion belonging to the genus Leiurus Ehrenberg 1828 is described on the basis of four males and six females collected in the region of AmesmessaTamanrasset in the south of Algeria. The new species, Leiurus hoggarensis sp. n., most certainly corresponds to the Leiurus population previously cited by Vachon from both the Hoggar and the Tassili N’Ajjer as Leiurus quinquestriatus. Several characteristics, however, attest that this population is unquestionable distinct from these found in Egypt, and both species can be distinguished by a distinct coloration pattern, different morphometric values and different number of teeth on the pectines. The type locality of the new species represents the most westerly record of the genus Leiurus in Africa, and the new species also inhabit a more mesic zone when compared to the central compartment of the Saharan desert. Leiurus hoggarensis sp. n., apparently does not present characteristics of a psamophilic species and may be considered as a lithophilic species. This is the 12th species to be described for this buthid genus. Lourenco WR, Kourim ML, Sadine SE. 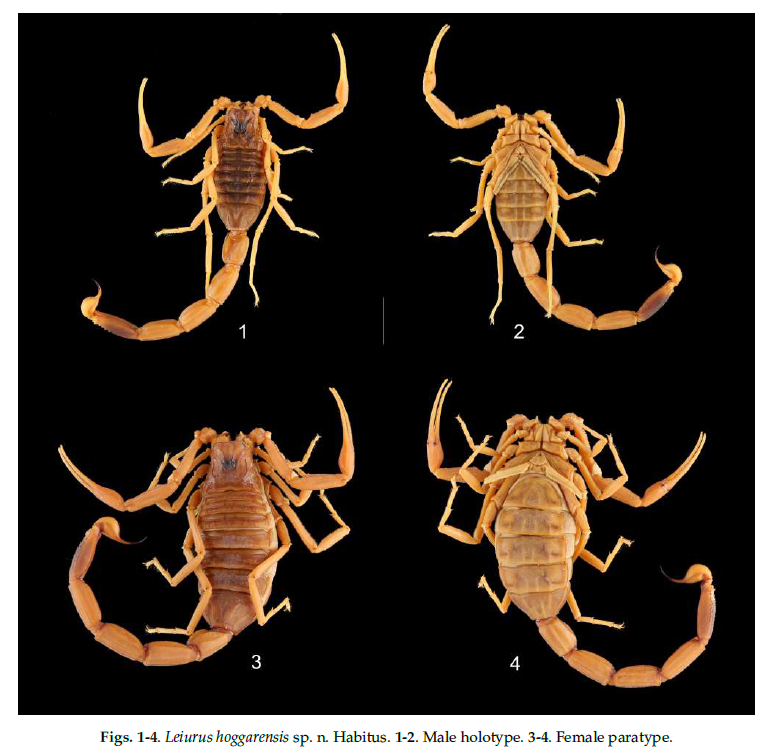 Scorpions from the region of Tamanrasset, Algeria. Part II. A new African species of the genus Leiurus Ehrenberg, 1828 (Scorpiones: Buthidae). Arachnida - Rivista Aracnologica Italiana. 2018;4(16):3-14. Thanks to Dr. Salah Eddine Sadine for informing me about their article!